Outgoing members of Congress are rarely hard-pressed for jobs (even when they've gone out in disgrace). 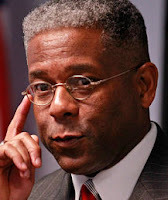 Tea Party star Allen West just accepted the one that was perhaps the most predictable: contributor to Fox News. The Hill quotes Fox's executive vice president of networking: "Representative West’s congressional and military experience along with his fearless approach to voicing key issues will provide a valuable point of view to the FOX News lineup." How unique that point of view will be on Fox News is open to debate.